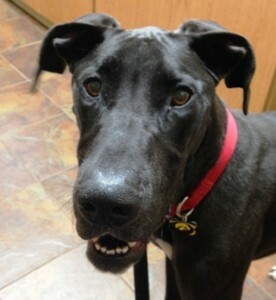 Meet Kinnick - Rocky Mountain Great Dane Rescue, Inc.
Hi, I’m Kinnick! I’m a 1 ½ year old black female Dane with natural ears. I’m a petite girl at 90 lbs, but it’s 90 lbs of sweet! My humans are getting ready to go protect our country, so I’m looking for a new place to call home. I’m good with other dogs and kids, though I can be unaware of my size. I’ve never spent any time around cats, but with some training, I’m sure I would be okay! I know all of my basic commands and am housebroken. I’m also crate trained. I love going for walks and am good on a leash with my harness on. I just can’t wait to find a fun new family to call my own – could that be yours?